Preparation time: 20 minutes. Chilling time: 5 minutes. Place chocolate chips in a large saucepan over low heat and stir frequently until melted and smooth; heat carefully to avoid scorching the chocolate. Remove saucepan from heat. Hold one pretzel at a time over the melted chocolate and spoon chocolate over pretzel, coating all except 2 inches at one end; use the back of the spoon to spread the chocolate evenly. (Rewarm chocolate over low heat as needed.) 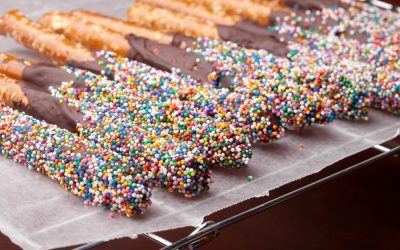 Lightly sprinkle each pretzel rod with sprinkles. Carefully place coated pretzels in a pie plate, propping the uncoated end against the edge of the pie plate. Chill coated pretzels in the freezer for 5 minutes, or until chocolate is set. Carefully remove from the pie plate and store in an airtight container at room temperature. Exchanges per serving: 1 starch, 1 fat. Carbohydrate choices: 1 1/2.